In my third year of school, I had an epiphany. A beer epiphany. Until that year, I equated beer with the watered-down, foamy stuff served at fraternity parties. Then I was introduced to the flavorful and rich brews that I’m now well acquainted with, and to be honest it was pretty life-changing (as any good epiphany should be). Today, I can proudly assert that it doesn’t get much better than a cold fizzy beer with a juicy burger or greasy take-out. While I’m no hop aficionado and haven’t made the leap to homemade brewing, I’m always looking and excited to expand my beer palate. So when I saw this pilsner and gin cocktail on the menu at Back Forty a few months back, I had to give it a try. Before this point, the closest I’d come to a beer cocktail was PBR and a shot…so my expectations were easily exceeded. With the tang of lemon and kick of ginger, the drink had so much going for it, but I wasn’t sure what a homemade version would taste like. After some trial and error, I managed to balance the proportions so the gin didn’t overwhelm the beer and the ginger-lemon syrup wasn’t cloyingly sweet. 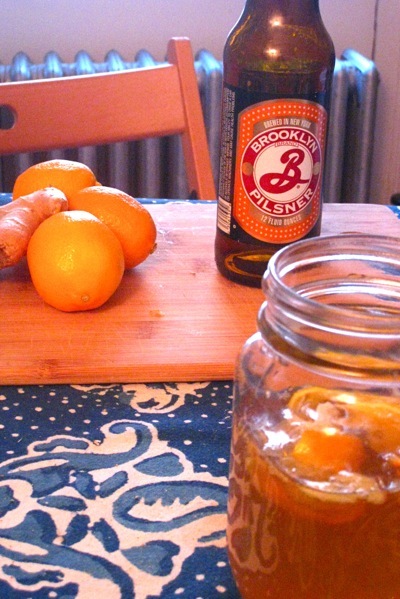 The result is a mellow drink with a slight kick, and the best part is, it’s nudging me towards spring. Meyer lemons, which you can usually find in the citrus section of your grocery store, bring a wonderful sweetness to this drink. Regular lemons are also great, but the drink may be more tart. Ginger ale is also a good substitute for the lemon-ginger syrup if you’re running tight on time, space, or kitchen access. Pour ½ ounce lemon-ginger syrup (or ginger ale) into a large glass. Squeeze fresh lemon into glass. Add gin and mix until well incorporated. Slowly poor beer into glass. Taste and add more syrup or fresh lemon juice as necessary. 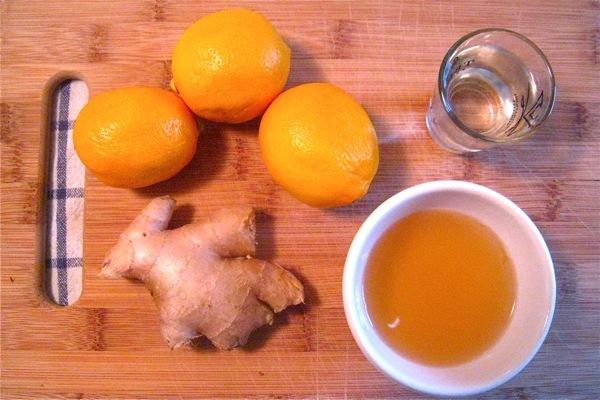 To make lemon-ginger syrup, heat water, sugar, ginger and lemon in a small saucepan over medium-low heat until sugar dissolves. Remove from head and let sit for 10-15 minutes. Syrup refrigerates wonderfully for future use.